The ghostly Boomerang Nebula, called the 'coldest place in the universe,' reveals its true shape in this image from the giant ALMA radio telescope. The background blue structure, as seen in visible light with the Hubble Space Telescope, shows a classic double-lobe shape with a very narrow central region. Image released Oct. 24, 2013. A ghostly nebula shining about 5,000 light-years from Earth is also the coldest known object in the universe. The dead star creating the Boomerang Nebula is sloughing off gas from its shell, which is producing the strangely shaped cosmic object, astronomers have discovered. The gas is cooling as it flows away from the white dwarf star in a process similar to how refrigerators stay cold by using expanding gas. "This ultra-cold object is extremely intriguing, and we’re learning much more about its true nature with ALMA," Raghvendra Sahai, the NASA Jet Propulsion Laboratory principal scientist who led the research, said in a statement. "What seemed like a double lobe, or 'boomerang' shape, from Earth-based optical telescopes, is actually a much broader structure that is expanding rapidly into space." The Boomerang Nebula is considered a young planetary nebula, or an object that is formed when a dying star — one that was similar to the sun — sheds its outer layers and leaves a cloud of gas behind. This kind of star burns like the sun for billions of years before growing into a red giant, running out of gas and then fading into a white dwarf. In later stages of planetary nebula evolution, the white dwarf in the middle sends out ultraviolet radiation that makes the gas glow, producing bright colors within the gas. 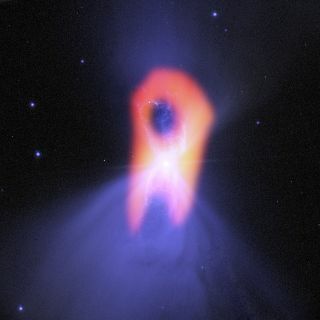 The Boomerang Nebula, however, is not quite at that stage, researchers said. It's visible right now because the star's light is being reflected off the dust grains. When first examined with Earth-based telescopes, researchers noted the nebula looked a little misshapen. In 2003, the Hubble Space Telescope revealed that it looks a bit like a bow tie or hourglass in visible wavelengths. Follow-up observations, however, revealed a mystery. It's common for planetary nebulas to have this bow tie shape, but usually this happens when gas ejects at high speed from the star. The jets of material punch holes in the surrounding cloud of gas that was produced when the star was a red giant. Researchers should have been able to see this bow tie shape at cooler wavelengths as well, but observations with other submillimeter telescopes revealed a different shape. ALMA, which has the highest resolution yet at the submillimeter wavelength, managed to solve the mystery. Carbon monoxide molecules in the cloud — which are very bright in this wavelength of light — were in the hourglass shape in the inner parts of the nebula. Further out, the molecules were in a rounder shape. Meanwhile, dust grains around the star — also visible in millimeter wavelengths — were masking some of the star's light in visible wavelengths, making it appear as an hourglass. "This is important for the understanding of how stars die and become planetary nebulae [nebulas]," Sahai said. "Using ALMA, we were quite literally and figuratively able to shed new light on the death throes of a sun-like star." The research was published Oct. 18 in the Astrophysical Journal.